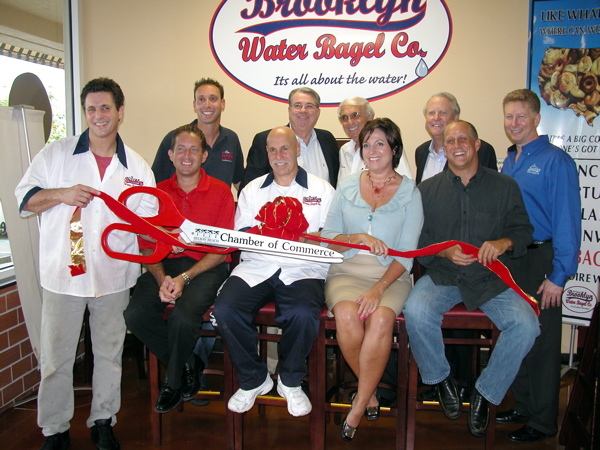 Brooklyn Water Bagel Co. owner Steve Fassberg, left, gets a hand from Delray Beach city commissioners and the Delray Chamber as he opens his first store. Brooklyn Water Bagel is on the west side Military Trail between Atlantic Avenue and Lake Ida Road. DELRAY BEACH — Grand openings are always times of big dreams for small business owners. Steve Fassberg, who officially opened The Original Brooklyn Water Bagel Co. on Monday, is no different. Except his dreams are bigger than most. Fassberg sees the restaurant, which sits on the west side of Military Trail between Atlantic Avenue and Lake Ida Road, as the cornerstone of a vast franchising empire. His secret weapon: water. Not just any water. Brooklyn water. Municipal Brooklyn water, or a chemically identical copy there of. So exactly how what does water have to do with bagels? Apparently everything. Delray City Commissioner Gary Eliopoulos, a Brooklyn native who took part in Monday’s grand opening, said his mother, after moving to South Florida always complained that the bagels here just don’t taste the same as back home. “It’s the water,” Eliopoulos said. You might imagine the Brooklyn water works with a giant pipe pulling water from the East River or something equally unappetizing. But the water, according Ray Fassberg, actually comes from the mountains outside the city. Ray Fassberg is Steve Fassberg’s dad. 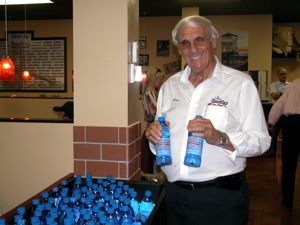 “It’s the best water in the world,” Ray Fassberg said. Water, of course, is a major component of most doughs, be it for bagels, bialys and pizzas. 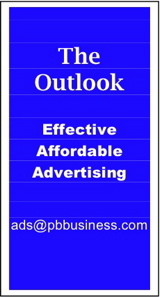 Even after baked, the final product retains the qualities of the water from which it is made. Ergo if you want bagels to taste like Brooklyn bagels, you need Brooklyn water, Fassberg says. Of course there’s the problem of geography, Delray being exactly 1,043 miles from Brooklyn. Ray Fassberg says people have attempted to solve the problem by trucking in water, but that’s a bit impractical. The Fassbergs’ solution: make your own Brooklyn water. The Delray restaurant has its own water works on the premises that filters South Florida municipal water and transforms it through a 14-stage process so that it tastes exactly like you’d find in Prospect Heights. “We’re the only ones that have have this,” Ray Fassberg says. The Fassbergs hope to have 1,000 stores nationally within five years. All will be franchised, except the Delray store and two others — one in Boca Raton and one on the strip in Las Vegas, says Patrick Martin, the store’s assistant manager and Steve Fassberg’s designated successor as top dog In Delray once it’s time to move on. 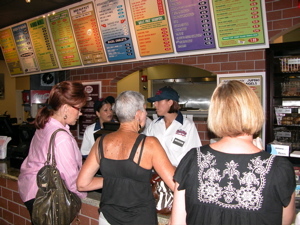 Martin said the restaurant has 27 employees; all will have the opportunity to buy a franchise in three to six years. All five Delray commissioners were on hand for the opening, plus the usual contingent from the Delray Chamber of Commerce, including Executive Vice President Beth Johnston and a record number of ambassadors.